BEST-IN-CLASS project solutions + integrated services provider. We deliver remote access, infrastructure and environmental services for construction and maintenance projects across Western Canada. We are a Company COMMITTED TO SERVICE WORK that stands the test of time. while continuously improving our business practices. If you share our vision, SITE is always looking for skilled and motivated individuals to join and improve our team. If you strive to be a part of a committed, hard-working and rewarding team, please check out our career opportunities. SITE has offices in 14 communities across Western Canada, and an exceptional reputation for delivering projects from Canada’s north down into the Bakken Formation. We have a lean leadership team with deep roots in the communities where they serve and a strong drive to make a difference through their work. We take pride in having a large-scale presence with a small company culture. We grow through acquisition, backed by Houston-based SCF Partners and with due care to onboard companies that round out our capabilities and presence in access, infrastructure, and environmental project solutions and integrated services across every sector and any size project. Lyle leads SITE’s executive team and its work on strategy, risk management and corporate governance. He is responsible for the overall operations at SITE, ensuring every project is executed safely, on time and on budget. Brad leads SITE’s financial planning and analysis, and supports strategic planning, decision-making, and internal change management. He works closely with SITE’s financial, accounting, and legal partners and stakeholders, and is responsible for identifying and acting on business risks and opportunities. Todd leads SITE’s business development and marketing efforts. He is responsible for ensuring that SITE’s potential and existing clients, vendors, and employees recognize the company’s strengths and the value it brings as a best-in-class integrated service contractor. Ron leads SITE’s work and effort to attract, retain, and support its team members. 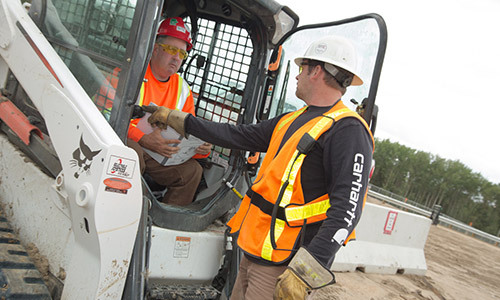 Safety is first and foremost in his title because it’s first and foremost to SITE’s values and operations. Ron is also responsible for the policies and programs that make SITE an employer of choice and great place to work. Gail leads SITE’s relationships and commitments to its stakeholders, Indigenous partners, and the communities where it works. She provides support and guidance in the areas of Sustainability, Risk Management, Strategic Planning, and Community Relations. Blair is an operational lead for SITE. He is a primary point of contact and resource for SITE Equipment Ltd. and provides strategic oversite on all municipal infrastructure and aggregate projects. Blair is one of five Vice Presidents who share accountability for leading operations across Western Canada. Chris is an operational lead for SITE and one of five Vice Presidents who share accountability for leading operations across Western Canada. Chris is responsible for strategic planning, customer relations, community engagement; while fostering the safety and quality culture and financial performance diverse project portfolios demand. Leo is an operational lead for SITE. He is the primary point of contact for SITE’s major projects and is instrumental to ensuring that all business operation processes are aligned. He is one of five Vice Presidents who share accountability for leading operations across Western Canada. Danny is responsible for the overall strategic direction and business growth of the clearing and environmental segment of SITE. Danny plays a key business development role with our Northern communities and is one of five Vice Presidents who share accountability for leading operations across Western Canada. Evelyn is responsible for working internally to ensure that SITE puts its best foot forward on all potential opportunities and externally for ensuring potential and ongoing clients recognize the many benefits of SITE’s rigor, quality, efficiencies, exceptional project management, and commitment to continuous improvement. Marc leads SITE’s commitment to quality and extensive efforts to ensure that continuous improvement drives its achievements. He is responsible for maintaining and advancing SITE’s quality management and continuous improvement cycle at all levels of the organization – from field operations to executive leadership. Leland is responsible for the projects, including the staff and resources, in SITE’s northwest region, including northwest Alberta and into British Columbia. He ensures that SITE is meetings it performance targets, and delivering the best results for its clients. Joe leads the geomatic team for SITE across Western Canada. Working with state of the art equipment and continually looking to lead the industry with innovative systems that improve safety, quality and accuracy to all SITE’s surveying practices. Roger leads the operations team in SITE’s southern region with an additional focus on environmental and renewable energy projects. Roger provides strategic oversite on all projects ensuring quality, safety, and execution are the number one priority. Brad is SITE’s lead for the Northern region. Brad who provides oversight to ensure projects run smoothly and efficiently, to meet or exceed the client’s expectations and requirements. Troy is SITE’s lead for pilings and foundations. SITE offers the procurement, equipment, and manpower to deliver pilings and foundations as stand-alone services or part of multi-phase projects in any sector. Troy ensures that SITE’s services stand apart for quality and, where required, integrate easily into project timelines and desired outcomes. Jason is SITE’s lead for infrastructure. SITE’s infrastructure capabilities and experience are extensive and run across all sectors. Jason is responsible for overseeing all aspects of SITE’s infrastructure work and, regardless of the region, ensuring that it stands apart for quality and meet the client’s overall project outcomes. Russ is an operational lead for SITE. He is the primary point of contact for SITE’s clearing, access, and environmental solutions, and shares accountability for leading operations across Western Canada. Albert leads the equipment division ensuring that all equipment is maintained to high standards and meeting all safety requirements. Equipment is dispatched across the four Western provinces with Albert guaranteeing the most cost effective and on-time delivery. SITE employees are always expected to conduct themselves in a professional and ethical manner. Our hotline policy provides employees or bystanders with a means to report any breaches of law, ethics, behavior, policies, or any other abuses in a confidential and anonymous format. The Employee or Bystander shall receive no retaliation or retribution for a report that was provided in good faith. A Employee or Bystander who makes a report that is not done in good faith is subject to discipline, up to and including termination. Anyone who retaliates against the Employee or Bystander (who reported in good faith) will be subject to discipline, up to and including termination. Crimes against a person or property of an illegal matter should immediately be reported to the local law enforcement agency. Internal personnel must promptly act to investigate and/or resolve the issue. The Employee or Bystander shall receive a report within five business days of the initial report, regarding the investigation, disposition or resolution of the issue. If the Employee or Bystander is not satisfied with the investigation of a report conducted in good faith by internal personnel, then they have the right to report the event to the appropriate authorities. The identity of the Employee or Bystander, if known, shall remain confidential to those persons directly involved in applying this policy unless the issue requires investigation by law enforcement. In this case, members of the organization may be subject to subpoena. Please provide details with respect to the location of the incident (e.g. region, specific location, and department). Please describe the nature of your concern regarding operational and/or financial matters. Include sufficient information for an independent person to understand the concern and to enable further investigation. Please state the full name(s) and title(s) of individuals whom you suspect of wrongdoing. How long has this incident been taking place (if applicable)? If YES then please provide your name and telephone number. Would you like to arrange a meeting/telephone call with an investigating officer to discuss this matter? (Please note that this option is only open to individuals who chose to provide their name).